It’s rare that I slip trail shoes, or any shoes for that matter, on my feet where the fit is absolutely perfect—where not one toe is scrunched, not one nail is compressed, and where my midfoot and heel are snugly held in place without any constriction or potential for friction. 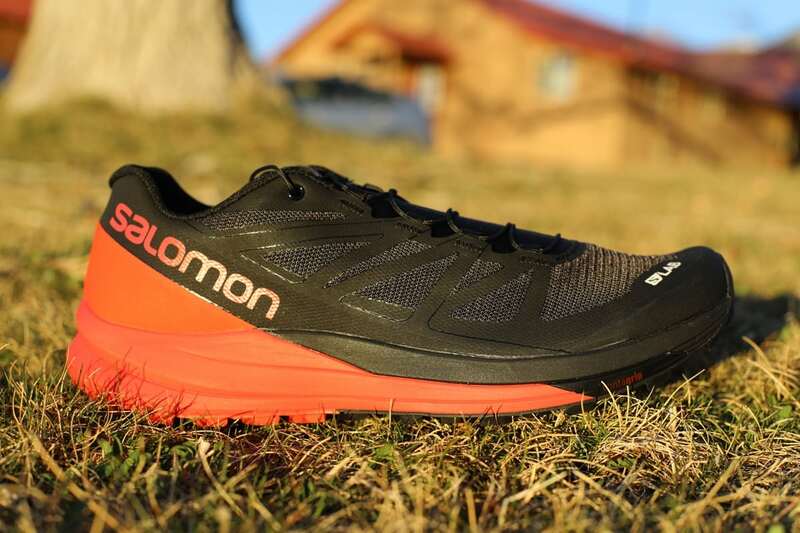 For my feet, Salomon’s fit has often been as close to perfect as there is. I have a long and storied history with the women’s Speedcross, and despite the soccer-boot narrowness and lack of true forefoot cushioning, it has never cost me a race—several toenails and some tender foot bones, yes, but not a race. I dabbled in the women’s Sense Pro a few times, and while I loved the fit even more, I rarely got more than 200 to 250 miles out of the shoe as it tended to break down quickly for me. Needless to say, I was very excited to test the new S-Lab Sense Ultra ($180) the past several months. I should highlight that it is Salomon’s unisex fit which I really struggle with only because I do believe personally and professionally as a physical therapist that the anatomical and biomechanical differences between women’s and men’s feet and bodies are real and should be designed for as such. I’ve spoken with Salomon regarding a previous shoe about this, and they reassured me that the unisex fit is much closer to a women’s fit than a men’s. While I have not found this to be true for my foot in a few of their other unisex shoes, it does seem it to be true for the Sense Ultra. Perhaps it’s the ideal alignment of Salomon’s technologies and research for me. 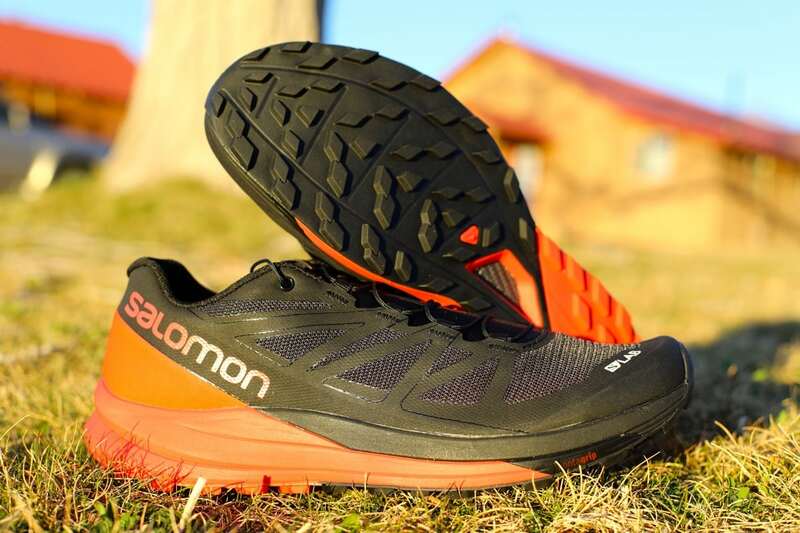 The Salomon S-Lab Sense Ultra is a 275-gram shoe that has an 8mm drop while keeping the overall stack height at 26mm in the heel and 18mm in the forefoot. It’s said to be the ultrarunning version of the racy Salomon Sense 6 (220 grams, 4mm drop, and less cushioning). Personally, having not worn the Sense 6, I found it to be similar to the Sense Pro with the roomier forefoot, the perfectly dialed-in mid- and rear-foot, but with much more effective cushioning and durability. The Sense Ultra can tackle almost any terrain in most conditions without a second thought. What you lack in traction with the smaller lugs (compared to the Speedcross or other deeper-lugged shoes), you more than make up for in ground feel, stability over uneven obstacles, and the firmly cushioned ride. I’d still prefer a pair of deeper lugged shoes for muddy and snowy conditions, but for everything else, this shoe is outstanding. The upper utilizes a single-layer, quick-dry mesh combined with a nylon layer to enhance breathability and flow of moisture out of the shoe. The overlays greatly enhance the stability of the upper by continuously wrapping from the lace guides down to a full-perimeter overlay that integrates in with the firm but pliable heel cup. This coupled with the substantial toe bumper provide a lot of protection to incursions from trail debris without adding much weight or stiffness. This Sensifit system integrated with the Quicklace lacing cradles my foot really well. After the first time wearing the shoe, I was able to adjust the lacing such that I rarely have to do more than pull the tab to tighten and go. Occasionally if I get the laces too gunked up with mud I have to make a few adjustments, but it’s rare. I know these laces don’t work for everyone, but for me, I have no issues. The internal fit of the Sense Ultra upper feels almost custom. 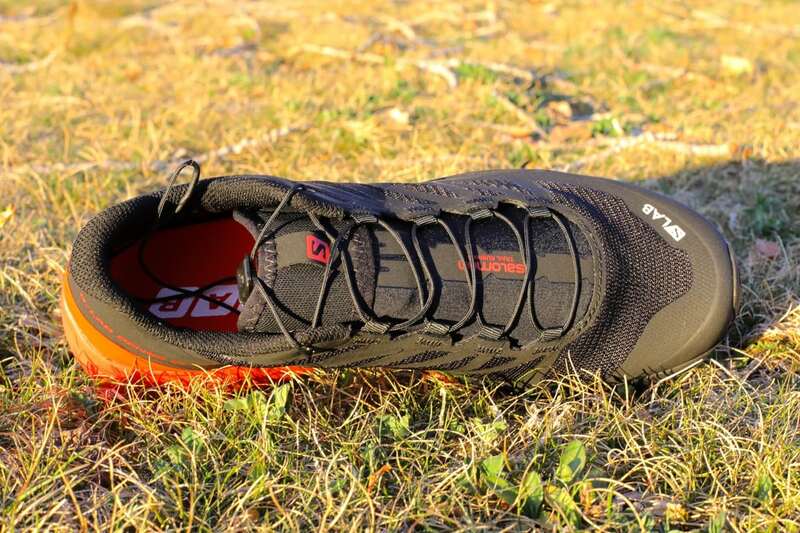 Salomon calls it the Endofit technology, but it truly does make the shoe feel like an extension of my foot. Combined with the Ortholite open-cell molded footbed, and the wider padded tongue, it’s this trail running Cinderella’s dream—a perfect fit. After 150 miles of every kind of condition (snow, slush, dust, dirt, puddles, and light mud), there is not yet any place in the upper of my shoes that shows abrasions or is flexing uncomfortably. I look forward to many adventures to come. The Salomon S-Lab Sense Ultra’s lateral upper. The midsole of the Sense Ultra is comprised of a dual-density compressed EVA. The technical description of the midsole utilizes words like “high rebound,” “exceptional energy return,” and “substantial cushioning” and these truly bear out in my experience. 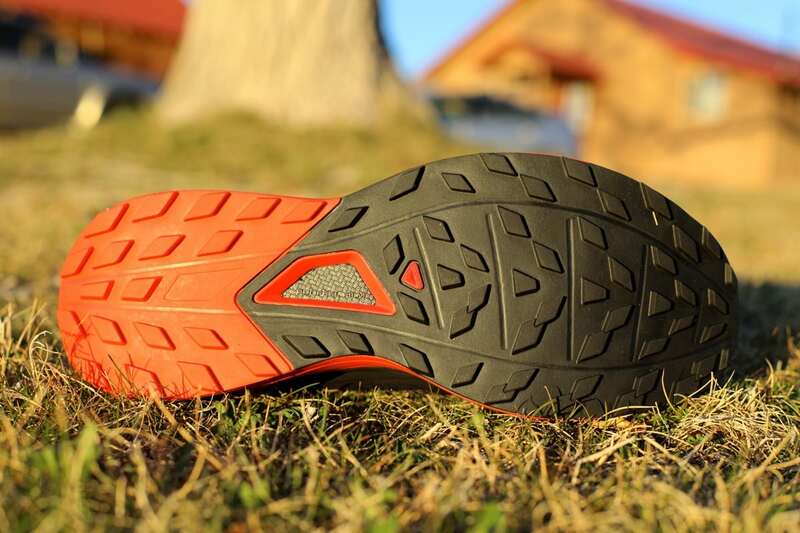 Functionally, the EnergyCell+ compound utilized provides a very pleasant, firm, cushioned ride with no energy wasted by the ample shock absorption. Energy out through my lower kinetic chain results in direct propulsion forward. Another aspect of the ride that I really appreciate is the ease with which the shoe rolls from initial foot strike through toe-off. I’m not an exceptionally efficient runner, but this shoe maximizes the flow as I roll through the stance phase of running regardless of whether I’m speeding on flat ground, pushing hard up a hill, or powerhiking along. The OS Tendon construction and the Profeel Film make the transition from heel to toe seamless even right out of the box. I don’t often feel ‘fast and zippy’ when I run, but these shoes convince me that I am. I’m most pleased with the durability I’m continuing to find in this midsole. The shoes are just as comfortable now in the summer temperatures as they were a few months ago as our blasts of winter continued to alternate with unseasonably warm weeks. The temperature and humidity swings haven’t affected the rebound or ride at all. Granted, I keep these shoes sheltered in my cozy, climate-controlled home and not on the rack of retired but still functional shoes in the garage, but I’m quite convinced these shoes have several hundred more miles in them. The Salomon S-Lab Sense Ultra’s medial upper. The outsole is Salomon’s Premium Wet Traction Contagrip compound that is one of the best in the industry for creating traction in rocky, wet, and otherwise adverse conditions. It’s highly durable and at 150 miles of testing shows no obvious signs of wear. This shoe is equally adept at climbing steep dirt trails with some light scrambling as it is rolling down a dirt road when the high country is off limits. I had no difficulty over sections of packed wintry trails as long as there was some roughness to the surface of the snow. In the absence of clay, the outsole sheds mud very quickly. The clay tended to build up only to the lug depth before peeling off mid-stride—Colorado Front Range approved. The Salomon S-Lab Sense Ultra’s outsole. 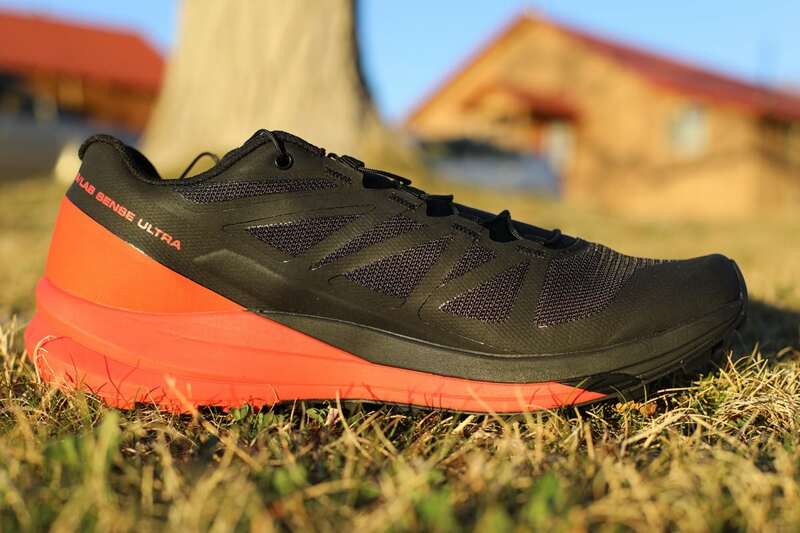 The S-Lab Sense Ultra is certainly one of my top choices for a summer and fall trail racing shoe at any of the distances (half marathon to 50 miles) I tackle. I simply love the shoe. It’s the perfect combination of a perfect fit with a smooth, nimble, yet protective ride. I can’t think of one thing I’d improve or alter. The only drawback I see for some, including me, is the price point. There are countless arguments on either side of the price versus quality debate, but each runner has to make that decision for themselves. Good luck with that conundrum if the siren’s call of the Sense Ultra proves loud. Have you run in the Salomon S-Lab Sense Ultra? What are your thoughts on the shoe in general? And how about the fit, ride, and upper specifically? And are you finding the shoe to be durable, too? The Salomon S-Lab Sense Ultra’s upper viewed from the top. I find that the traction/grip isn’t really there when it comes to loose gravel/rock, and certainly not wet rock, which you typically find on Austrian mountains. The protection from sharp rocks in the forefoot is there, but nothing like as in the XA Alpines with a carbon plate in it. On slippery/wet trails with a little bit of mud, needles/leaves, roots, the shoe for me also doesnt provide much traction, in particular on (technical) downhills. My reference for a good shoe in these conditions would be Dynafit’s Feline Vertical Pro with its Vibram outsole which I find far superior in any of the aforementioned conditions. On forest service roads, absolutely non-technical hard packed trails in dry conditions or even on tarmac, this shoe is fantastic and my first choice. But certainly not for mountain running. Thanks for your input. The mountains in Austria are no doubt significantly different than much of the terrain I run and power hike on. The Dynafit shoe sounds really interesting, and I’ve not seen it yet! I may have had a defective pair but both shoes uppers wore out where the toe box flexes just before the laces begin after some ultra training and one 80km Ultra race. I mean completed shredded in that area. Solomon was great and warrantied the shoes by replacing them. I did however like the fit and feel. They were not abused. It looks like the Salomon Speed Cross series have much better traction than these…Has anyone used both and have a review? I run mostly technical/rocky trails here in Tucson and this shoes beats any I’ve had for that. My previous shoe was the s-lab wings 8, which were better for steep scrambling due to the stiffer midsole, but the sense ultra wins in all other conditions. I even took the sense ultras up and down some dry ski slopes last weekend, where they were plenty grippy and protective. This is the best shoe I’ve ever had. I fully expect to get about ~700 miles out of them. Since they’re unisex sizing, does Salomon have a conversion chart for women? I haven’t had luck finding these in any shops in the Front Range, and it looks like they’ve brought back some inventory of this shoe online (which was sold out for a while). I wear a 8 in the Women’s Sense Pro 2. I wear an 8.5 women’s and 7.5 unisex with them. I’ve put around 125 miles on these shoes running on trails with varying degrees of technicality over the past couple of months. They are a 10/10 on comfort for fat/fast, steep/slow, and even running over large rocks and high-tech mountain trails. That being said, I’ve had a couple of slips, all on soft downhill slopes, which I think is expected for the lower profile lugs. For me, this is a great fitting shoe with lots of cushion (which I like bc I can train frequently without over-abusing my legs) and I think it’s perfect for what I needed – a versatile semi-maxi that I can put lots of hard training miles on without them blowing up. Highly recommend! Amanda, typical conversion is 1.5 sizes. A mens 6.5 ‘should’ work. I just trained for and ran WS100 in these and love them. It’s the only pair of Salomon shoes I’ve ever owned and they worked really well for me. I did a 100 mile race on hard, flinty trails in a pair these and a pair of the thinner injinji socks and had no blister or toenail issues at all. Fit felt secure but not tight (bought usual size), and very breathable. Never really had to think about my feet at all, other than a few times when a stone struck the upper as there is not much protection on the top of the foot. Very pleased with them and will definitely be wearing them for my next ultra. Sounds like the perfect shoe and I’d love to try them BUT they costs 240 US$ in my part of the world and even 180 US$ are an absolutely ridiculous price to pay for a pair of running shoes. Have my eyes on the newly released Sense Ride that should come in at around 120 US$. Seriously though, who pays nearly 200 bucks for gear that lasts only some 2-6 months if used almost daily?? I’ve found that they last longer than two pairs of my previous shoe (NB Leadville Trail). I have ~700 miles on one pair and none of the lugs are worn off. The durability of this shoe has helped me handle the price. I’m with Paul here – s lab shoes have consistently lasted me ~2x as long as my past trail shoes (almost exclusively sportivas). I may subconsciously be more careful with them due to the higher price, but they last longer nonetheless. I’ve done several trail ultras in my S-Lab Ultras, all with good results. It does appear that the midsole is breaking down on par with other Salomon shoes. The sole is well built and shows little wear at 300 miles. They have developed an odd clicking sound in the flats which began at 150 miles, drives me nuts on long runs. The padding isn’t the Hoka style cushioning that feels like you’re floating. It is a little less forgiving but makes footfeel a little better than Hoka. Much more cushioning than the base Sense. In response to another comment about traction compared to the Speedcross, these are two VERY different shoes. Speedcross is for mud and sand and grime and snow and things that require a shoe to dig. S-Lab ultra is for distance trail running on soft ground, dry to only lightly mucky conditions. Adding to my comments, just finished a multiple day race series. Started with the s-lab sense ultra. If running in extreme heat and humidity like the southeastern US, these shoes retain water and will pose issues on downhills. My feet were in bad shape after the first day with the Salomons. Granted, his was 95% humidity and mid-90s. I switched to the Hoka Challenger ATR 3, which I don’t necessarily like more than the Salomons but do shed water better. Great shoes, but one lace hole on each shoe is starting to get cut through. I had the same happen on my sense 6 sg, and it eventually severed the lace and lace hole was almost cut through. disappointed that the same is happening to the sense ultra, but Salomon swapped it out. I have worn Salomon shoes for many years now, and this has never happened, especially 2 of the latest models in the S-Lab line. Salomon needs to re-inforce the lace hole with plastic piece much like the sense ride. I will caveat these comments by saying that I have been dealing with a traumatic ankle/Achilles injury for the past few seasons, so I have gone from being able to run in almost anything to a price and the pea with shoes. I think these shoes are fantastic, and the best ultra shoe Salomon has produced. I ran Gorge Waterfalls 100km in these almost straight out of the box, and they handled the snow, mud and rocks very well. I made the mistake of lacing them a bit tight (ankle/achilles paranoia), which caused some pain in my right foot and impeded my downhill running in the second half (by the time I adjusted the laces it just prevented the foot pain from getting worse). Now I lace them quite loosely and they still fit well enough to handle running on fairly technical trails and long days out. To be sure, I chose La Sportivas (Mutants, old C-Lite 2.0s) for running in extended patches of Sierra snow last week, but I would have done ok in the Salomons, and with the death of the C-Lite 2.0, I do not think Sportiva (or anyone?) now makes a shoe that can handle tough mud/snow fluently and get an average runner through 100km/100 miles. I am very curious to see how the new custom Salomons pan out (despite them only being available in Europe currently). Maybe you could get a shoe like this with a Speedcross tread? Up there as one of the most enjoyable trail shoes I’ve ever run in. Never thought a shoe could be worth $180, but yep. All of the design choices work so well together — outsole is grippy, (surprisingly) durable, and road-compliant; midsole is pleasantly softer and with more forefoot flex than I expected; and the upper is magic. I think what sets the Sense Ultra apart is the fit. It’s snug and cozy in all the right places while still somehow leaving my toes space to wiggle. These shoes have showed me how much of a difference fit can make to the overall ride experience and comfort on trails, where the foot orientation is constantly changing with terrain. Everything on the Sense Ultra really just comes together for a solid, disappearing on your foot experience – which I think should be the goal for a shoe. Getting used to the quicklace system did take me an adjustment period as a newbie (tip: progressively tighten from the bottom of the laces toward the tongue to get even pressure), but I’m a convert now as they do stay tight after hours of running. The only area I’d like to see improvement/change in (other than a lower price tag!) is drainage. Water seems to have a difficult time escaping after creek crossings. Otherwise, a great shoe that keeps showing up for more miles. I’m ready to stock up on replacement pairs since it looks like some significant changes are coming to the upper and midsole in v2, but I can’t figure out if/when my first pair will wear out. I’m at nearly 400 miles without significant wear, which isn’t the worst problem to have. I don’t normally post reviews, but I thought I’d share my experience, as I have not read/heard of anyone else having this problem. I *love* this shoe. And, I know it’s a tangent, but I’m looking for something similar for an upcoming road 50-miler. Anyone out there have any suggestions? Anyone know a road shoe that reminds them of this one?